Deck Staining and Sealing Tips | 41 Lumber - Serving Iron Mountain and the U.P. The days are getting warmer, and summer will be here before you know it. If you’ve decided that your deck needs to be stained or sealed, then it’s important to take the time now to do it right so you can enjoy the beautiful, worry free new finish on your deck. With all of the activity your deck will see this summer, you will want to make sure that it is properly protected from the foot traffic, barbecues and exposure to the elements ahead. Below we have included some tips to ensure that you will be able to stain your deck with professional-looking results, without paying professional-looking fees. Begin with a properly prepared deck surface. The wood must be clean, dry and free of contaminants. If you try to apply stain or sealer over damp or dirty wood, then there won’t be proper adhesion. Make sure there is no mildew as well. To achieve this, use a wood cleaner and thoroughly wash your deck. 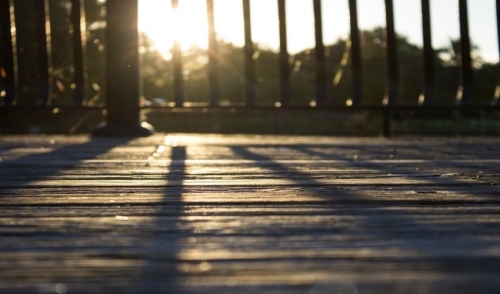 If there is still residual signs of old sealer, then you may need to wash your deck with a wood stain/sealer remover. The next step is to use a wood deck brightener, since sometimes wood cleaners and strippers can darken the wood. Allow the deck to dry thoroughly for several days before you begin staining or sealing. Depending on your choice of stain or sealer, it is important to follow the application instructions of your particular selection. Some are designed to be applied with a brush, roller, stain pad, or a sprayer. Choose the method that is most appropriate for your deck’s layout and its surroundings. Some of the most common staining and sealing mistakes are applying too much and leaving lap marks. Avoid over-application by back-brushing any stain or sealer that has not been absorbed by the wood over the span of a few minutes. A swipe with an absorbent rag will work for this as well. Otherwise, the excess stain or sealer will simply leave a puddle that will drip or eventually leave a shiny spot that can flake off. To avoid lap marks, coat one complete board at a time, only starting the next board once the previous has been finished. During the prep phase, never use wire brushes or steel wool, as this could imbed metal fragments into the wood which could rust and stain in the future. Choose a quality product. The goal is to enjoy your deck, so why take shortcuts in quality that can result in you having to repeat this process more frequently? When washing your deck, protect any outdoor outlets. Protect surrounding plants and bushes during the cleaning and staining process. Protect any paving stones and concrete around the deck. It may not be possible to remove the stain if he gets on them. Stain any vertical surfaces first, such as railings. Use a drop cloth, however, to avoid getting stain on the surface below. Otherwise the drips may show up as darker spots once the project is complete. Stain the deck’s floor surfaces last. That way you won’t need to walk on any fresh stain. As most manufacturers recommend, if you will need more than 1 gallon of stain, then mix them all together to ensure proper color consistency. If you decide to use a sprayer, take extra care to wipe up any excess drips or puddles. Allow your deck finish to dry completely before replacing the deck furniture or allowing your pets to walk on it. For all of your needs, whether it’s deck repair, cleaning or staining, we have everything it takes to help you get the job done. If you have any questions about what type of deck cleaner stain or sealer is best for you, ask our helpful staff and they will be happy to assist you.